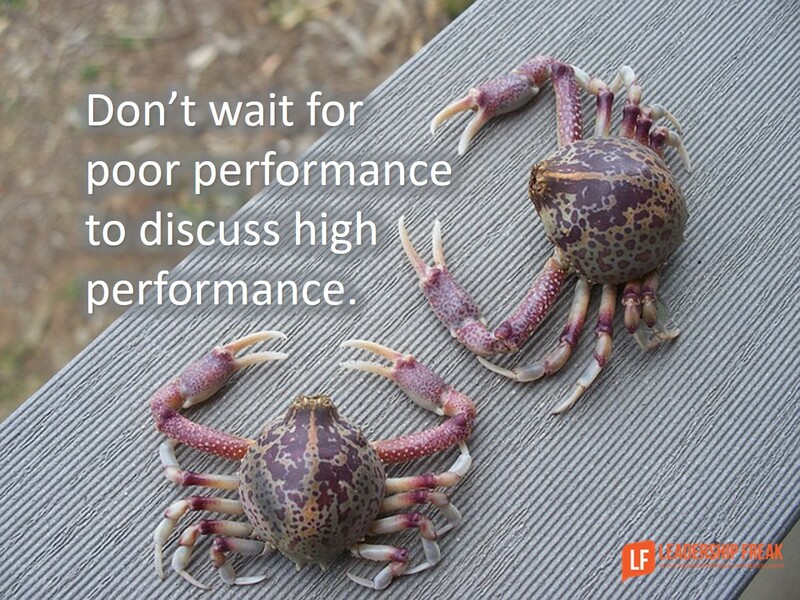 Don’t wait for poor performance to discuss high performance. Make ‘getting better’ normal by scheduling bi-monthly coaching conversations. Identify the 10 most important behaviors/skills on their list. Don’t worry about ranking them precisely. How would you rank your proficiency on these 10 behaviors/skills? Use a scale of 1 to 10. Don’t challenge their self-assessment unless it’s wildly inaccurate. The point of the exercise is improvement. Ask them to narrow the list to three items. Suppose they said they were an ‘8’ in communication. What’s important about communication in your role as manager? What are you doing when you’re communicating as a manager? How do you want people to feel about themselves when you’re communicating with them? How do you want people to feel about you when you’re communicating with them? When are you most effective as a communicator? When communication doesn’t work well, what are you neglecting? Work to get better. Ask, “How might you move from an ‘8’ to a ‘9’ in communication? (Don’t worry that you think they’re a ‘7’ and they think they’re an ‘8’. List specific observable actionable behaviors. Role-play or explain the behaviors. Suppose they would be a better communicator if they removed distractions. What distractions should be removed? Make commitments. What will you do over the next two weeks to remove distractions? Set a follow up meeting to evaluate improvement and select another item from the short list. Effective improvement is always self-development. What structure/questions would you suggest for coaching employees to assess and improve their own performance? What has helped you improve your own performance? Dan, this is an excellent practical approach. It reminds me of another approach by Anthony Tjan, outlined in one of his HBR posts. Once you have the short list of priorities you can then combine the coachee’s personal values, beliefs and aspirations with their professional role values, beliefs and aspirations, and with the company business goals by asking…..
(1) interests you the most? (3) do you think has the greatest impact on the business? The real magic happens when these 3 questions give the same answer. That is, the goal that most (personally) interests them and is (professionally) capable of achieving success with aligns with the item that has the most impact on their slice of the company business. The other conversation you are likely to have deals with the challenge that, as you may expect, that there is little conscious or formal alignment between the 3 answers. And it’s here that your coaching skills will shine. Thanks Mark. I’m glad you brought alignment of personal and organizational priorities to the conversation. That’s a great addition. Exploring and strengthening this alignment is essential to long-term success in any organization. Gaps between personal and organizational priorities are important issues to address. High energy employees always find strong alignment on this topic. In fact, I think your 2 paragraphs above nail the reason why engagement scores have remained disappointingly constant in the last 30 or so years. Thanks Mark. We have to come to grips with the problem of disconnection. It’s pretty hard to feel engaged and be on the fringes at the same time. Thanks Tim. Have a great week. For me its important that I be held accountable for my actions and goals, I really appreciate supervisors who are open to this conversation from the start. I introduce it with all my staff at the time of first engagement and annually as we have conversation about expectations. How can I best support you to achieve these goals? How can I best manage you and hold you accountable for the results you are looking to achieve and what would be a good way to bring this up with you so that you will be open to hearing it? Thanks Shelley. Your questions are powerful because they invite honest partnership where important issues are concerned. There’s real power in putting others in the drivers seat even as you move the ball down the field together. “What works best for you?” suggests a desire to adapt. Accountability says you’re serious about it. A good suggestions to improve performance Dan. I would add environmental factors that are instrumental in influencing performance. How they affect and how such factors can be shaped to improved performance. I always believe, and you have also mentioned. Behavior leads to performance. It means performance is the outcome of behavior. Therefore, if desired behavior is discussed, it can provide powerful boost to performance. Secondly, performance is always against set bench marking. We need to know, how such bench marking is set, and how employees view such bench marking. It they are enthusiastic about this, then it is the clear indication that performance will increase. But they when raise question about such bench marking, then it needs re look. Finally, the most importantly, how low performance is viewed plays role. If people feel happy to discuss, low performance, then it is a good sign, and there is scope for improvement. But when people hesitate to speak about low performance, then problems lies in the environment. Thanks Dr. Gupta. So Good to see your comment. I really enjoy how you write, “If people feel happy to discuss low performance then it is a good sign…” It would be great if more leaders approached low performance with a happy attitude. Our disappointment invites us to approach poor performance with an unhappy attitude. It possible to be unhappy with performance yet hopeful about getting better. Dan, I totally agree with your approach but there are some key issues leaders need to be aware of; 1)getting managers and leaders to take the time to have the meetings in the first place is a training process by itself, 2) leaders being aware of the actual activity of the person being coached because it is often second hand or limited, by choice or time constraints and finally 3) many leaders are fearful of actually doing this because they have never been through it themselves. Ideally, the senior leaders will embark on this with their direct reports first, then empower them to roll the process down to lower levels. I can actually see this eventually becoming a peer to peer coaching practice if embraced by all. Thanks Ron. You really added great value with your comment. One other thought that came to mind while I read your insights is frequent short meetings is better than long infrequent meetings. I got a good recommendation on a book called “The Coaching Habit – Say Less Ask More & Change the Way You Lead Forever” by Michael Bungay Stanier. He states there are 7 core questions to be asked in the following areas: 1) Kickstarter 2) AWE 3) Focus 4) Foundation 5) Lazy 6) Strategic and 7) Learning Question. I would imagine the questions above would fit into these categories and look forward to reading the details to learn more, as well as to compare and contrast. Thanks Lynne. Bungay’s book is a great read. I really like the emphasis on not exploring the questions, nor their own assumptions about where they rated. It is something I had never quite thought about, but both are things that could certainly impact upon the effectiveness of the conversation. Thanks Dan!